A mystical blending of heavenly symphonic washes, ambient tones and articulate piano. Haiku presents a wondrous, deeply relaxing work that sustains focus for all 67 minutes. This title is a re-release. Watch the video for "Eternity"
Haiku is the nom de guerre of Danish artist and composer Henrik Hytteballe who chose the name because he was attracted to the simplicity of Japanese haiku poetry. Flow was originally released in 2009 in Denmark, but as is so often the case, a release never hits the radar due to limited promotion and lack of global distribution. Thanks to Real Music and this re-release on their label, fans of new age/ambient music around the world can be introduced to the enjoyable music of The Haiku Project. Flow is a seven song, 67 minute journey into relaxation that is part new age style compositions and part ambient atmospheres that blend well together giving the listener the best of both worlds in one long form album. Henrik’s musical sensibilities are on display from the very beginning of track one, which is entitled “Atlantis,” as the layers and textures begin to gently enfold the listener and pull them into this peaceful world that he has created. The synthesizer creates waves of sound, much like waves on a beach, as they ebb and flow in a very hypnotic and soothing way. There is a very quiet piano that offers a point of interest to the calm washes of the synth sounds and Henrik has done a great job of allowing these distinct elements to move together, dancing with each other, but neither over powering the other. “Crystal Bath,” on the other hand, is more of an introspective track with a somber feel. This song definitely falls into the ambient end of the spectrum on this album, and even though it starts out as a somber piece, by the time you reach the last two minutes the music begins to morph into a delicate, airy, almost ethereal tone. These types of points and counter points highlight Henrik’s ability to skillfully move between emotions even within one composition. The album ends with “To Jorn,” which features the sounds of birds mixed in the background and a return to the more new age portion of the musical spectrum. This composition is basically a piano track that allows the listener to end their 67 minute sojourn with Henrik in a peaceful, reassuring place. It is easy to see why Real Music chose this album to expand to a wider audience through the re-release process. Overall the music is quite moving and weaves several themes into its fabric allowing Henrik to create a current within the structure of all of the songs that floats the listener down a calm and tranquil stream of consciousness. It is evident that Haiku, aka Henrik Hytteballe, is a talented composer who now, having been introduced to the world through Real Music’s re-release of Flow, will find that he has many new fans out there waiting for his next release. Recommended by Ambient Visions. The Not So Silent World … My grandmother who never spoke a word of English, used to tell me that someone who spoke two languages was worth two people. So now I can understand why Flow, the newest release by Haiku, which has vivid color and delicate symmetry throughout his seven track ambient album, is so captivating. He is a terrific paint artist as well as a gifted composer. The combination of music and art somehow meld together here to produce an eloquently simple album of gorgeous atmospheres and lush soundscapes. Haiku is the name taken by Danish artist Henrik Hytteballe who is an admirer of the simple, but beautiful form of Japanese poetry. The album features fluid textures and colorful collages of synth orchestra, inorganic voices, and ambient elementals. Hytteballe was an 80’s rocker and made a career on the concert scene, but a life altering change occurred and he literally changed his tune. The results are exemplary. If there be a mythical place that I would want to be, then let it be Atlantis. I am a believer and Haiku has provided the soundscape for a visit to this paradise. The swaying melody is created by what I imagine are muted horns, but for some reason I get the impression that the music has color. Soft pastels of gold, green, and mauve intertwine to build this dream world. It is all very calming. The song “Eternity” is active and alive. It has the sounds of life inside. The voices suggest tranquility, almost the equivalent of candle light versus sun light. If time is passing during this melody that I am unaware. Like the album title implies, there is a wondrous “flow” to this endless stream of music. I could not help but be immersed in the tune “Crystal Bath.” It was clear, yet luminous. There were reflections and refractions of pure energy. Once again, I could perceive the musical color that Haiku uses, patches of light here, pale colors there, all swirling in a transparent eddy of sound. Synthesized washes are abandoned for the tune “Vision.” Instead, distinctive electronic piano becomes the lead in a very serene song. The melody is slow compared to others on the album, but it still represents the title. “Vision” is without a doubt multi-faceted and complex. There is what you might see and what you imagine. It may be real or not. The music is like the soundtrack for the exploratory process. Let us see what we can see. If ever there was a sound scheme to allow the psyche to drift, carefree and without physical tethers, then it is the song, “Floating.” I imagined myself stepping up into the invisible otherworld, trusting it to hold me up. I laid back spread eagle and went with the cosmic flow. I became not fearful, but felt as if I were surrendering to the experience. This is a simple tune, but the impression was very intricate. The piano returns with the track “Voyage.” The song is one of the longest cuts at over twelve minutes and it is my favorite. Although I have traveled quite a bit in country, I still yearn to journey beyond my present borders. Those borders are not found on any paper map, nor electronic atlas, but lie within me. Each note struck in Haiku’s song was a step forward, the path became clear, and the journey continued. The final track is called “To Jorn.” It is somewhat different from the other tunes having a more pronounced melody. The piano is strong here with the accompaniment of other elements more subdued. The title implies to me that this is a personal undertaking, something made important by friendship or familiarity. I have to admit that the song is rather sad, but not a dirge or a lament. More like reverent and I liked it for that. The Haiku Project is a musician that is looking to further the ambient genre into something that is tremendously effecting while still being approachable by the widest swath of listeners. The album begins with “Atlantis”, an eight-minute track that feels to be a fraction of that. The compositions are haunting, airy, and represent the earth and sky with little more than a synthesizer. A narrative is generated through the compositions on Flow that can be picked up by individuals that focus on what is issuing out from their speakers. Ambient noise and voices are utilized to provide something wholly different from the other ambient efforts we have received. I feel as if The Haiku Project are able to utilize this human component in a very unique fashion — there is a sense that the world that the act presents on Flow is inhabited and utterly vibrant with the actions of young and old, but the vocals (when they do appear) are subsumed into the instrumental composition. Flow is both worldly and otherworldly, meditative, and above all, deeply relaxing. Its symphonic sounds are wonderfully subtle; while acoustic instrumentation rounds it out with warmth and depth. Flow flows from song to song, staying true to song titles such as “Vision,” “Floating,” “Eternity,” and “Atlantis.” It sets a stage for your imagination to take flight and play, discover and dream. Have you been thinking about new age in Denmark? Well, Real Music has and turned up this set that tackles variations on a theme you think you know well. Some pretty cool keyboard stuff with a lite Euro patina washed over it, this relaxation set will have you reaching for the gouda and edam rather than cheddar as you mellow out to it with some wine and cheese. Thoughtfully long enough for you to slip your massage therapist as a gift to update her record collection without her miffing that it doesn’t cover the length of the average session, a nice slice of inner peace is only a spin away. Check it out. 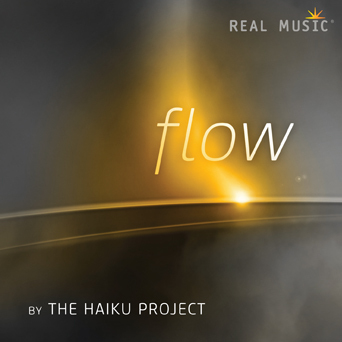 A CD certain to gain acclaim among fans of instrumental New Age music as well meditation / ambient / soundtrack albums is the 2014 Real Music CD release of Flow by the Danish artist known as Haiku. Essentially the creation of Danish electronic music synthesist Henrik Hytteballe, Flow is a masterpiece of transcendental synthesized sounds. Although Henrik has a background in both ambient instrumental and pop music, on Flow the sound is focused on sublime electronics and is more in the spirit of acclaimed Real Music artists such as Gandalf and Bernward Koch, but with a Danish twist. Although Haiku's Flow album was released in Denmark in 2009, it’s emergence as a Real Music worldwide release is a most welcome development for fans of ambient electronic instrumental music. With several releases in the Haiku catalog, Henrik’s specialty is in composing music for soundtracks and music for meditation and yoga, and there’s a definite sense of relaxing timelessness on the Flow CD. Henrik is also promising Haiku's much anticipated follow up to Flow, set for release in 2015. One of the most calming and reflective sonic experiences you could have, Haiku’s Flow is 21st century mood music at its finest.